Well this is it! The final book in a wonderfully funny, yet scary series all about a detective who just happens to be over 400 years old and dead. 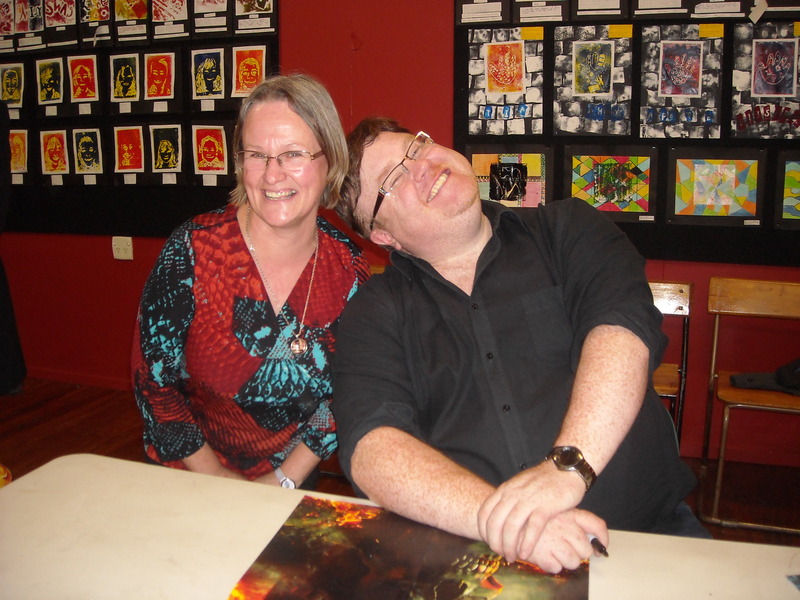 I was so fortunate to meet the author Derek Landy recently at an event here in Christchurch, New Zealand. He had the audience captivated from the get-go. His wonderful Irish accent and his contagious sense of humour had us laughing the whole hour he spoke. And then he signed books for another two hours. Everyone was made to feel special and he took time to actually chat with each fan. Readers of all ages lined up and waited so patiently. It was a brilliant night. Grab hold of the last book although if you are a fan you will have done that already. If you haven’t then now is the time to start. While primary school students will enjoy the first few books it might get a bit darker towards the end but a fan is a fan no matter what age. The final battle begins – but who will make it out alive? The Skulduggery Pleasant website is a must to visit. Author Derek Landy clowning around, and me.